Rezin P. Bowie (September 8, 1793 – January 17, 1841) was a land speculator, slave trader and profitter, volunteer soldier in the Louisiana Milita and Avoyelles Battalion, Louisiana plantation owner, inventor, Avoyelles Parish Police Juror, Louisiana State Legislator from Avoyelles (1827) and brother of James Bowie, the Alamo hero. He was born near Gallatin, Tennessee and his family moved to Louisiana in 1802 a year before Napoleon sold the Louisiana Territory to the United States. In 1814 he married Margaret Nevil in the St. Landry Parish Catholic Church in Opelousas. In 1824 he settled in Bayou Boeuf Village in Avoyelles Parish and lived at his plantation until 1827. During this period he made the first Bowie Knife at his blacksmith shop. This was the famous knife that James Bowie defended himself with in the “Sandbar Fight’ in 1827. When he failed to divide Avoyelles Parish into two parts after loosing the election as Sheriff in 1827 to George Groton, he resigned his seat in the Louisiana legislature from Avoyelles and moved to Terre Bonne Parish. He died in New Orleans on January 17, 1841 and was buried in San Gabriel Catholic Church Cemetery. 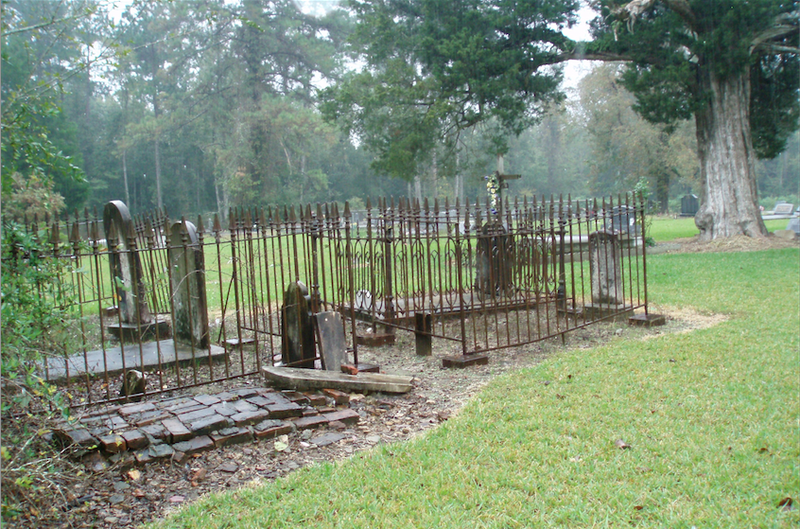 Later, in the 1850’s his body was disinterred and reburied in Port Gibson, Mississippi where his daughter lived. No one single deed supports his being Avoyellean of the year, but taken together, Fabius Ricord's public service to the peoples of Avoyelles is notably outstanding. He was also a humanitarian as we see from a 1863 newspaper clipping. We choose the year 1863 as this was a year that he apparently donated the use of one of his buildings to aid sick and injured soldiers during the Civil War. As noted in the Marksville Bulletin of 1864, "The Confederate Hospital is now located in Mr. Ricord's building on Monroe Street." One of the most prolific individuals in the early history of Avoyelles Parish was Fabius Ricord. 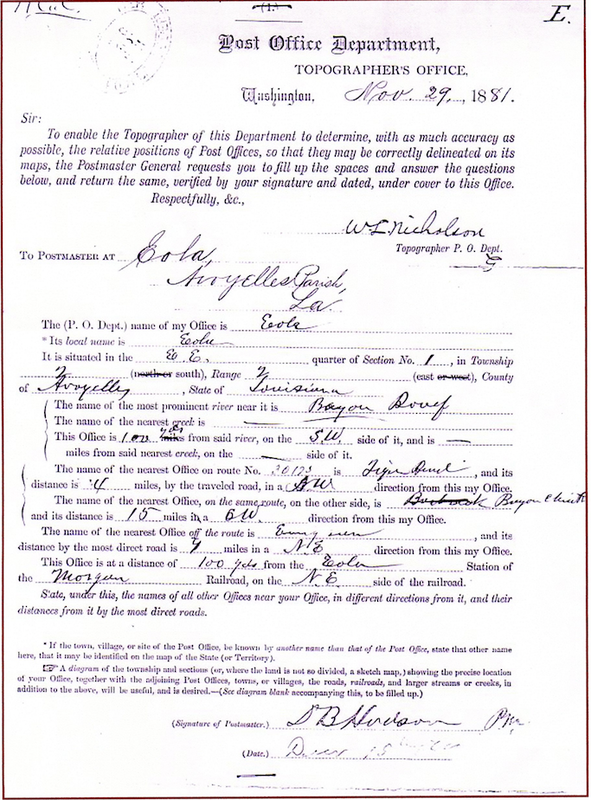 He is referenced as a Notary Public, Postmaster, Mechant, Sheriff, Clerk of Court and landowner. Variations of the name F. Ricord, Fabien Ricord, and Fabius Ricord - appear in several different places in Corinne L. Saucier's History of Avoyelles Parish, as noted below. His name is first mentioned as being the Postmaster at Holmesville in 1838. This was where Mr. Ricord began his great public service career in Avoyelles Parish. 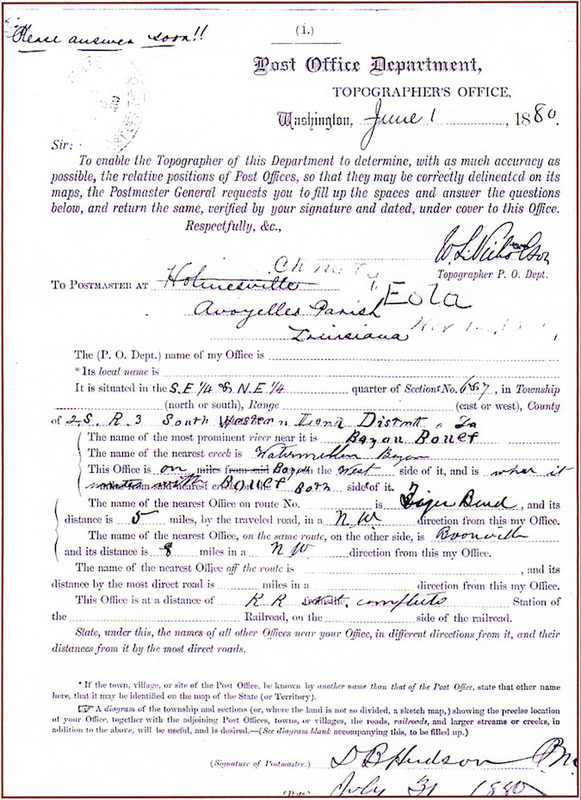 The General Services Administration, National Archives and Records Research list his name as being Fabius Ricord, postmaster at Holmesville in July, 1838. Corinne L. Saucier's History of Avoyelles Parish references his name several times as noted: Fabius Ricord was Sheriff of Avoyelles Parish in 1843 and 1874. *F. Ricord's store in Holmesville in 1847 Fabius Ricord is listed as being the Clerk of Court, 1856-1859; again from 1864 to 1865. According to the Avoyelles Abstract and Land Company, Fabius Ricord purchased two acres of land in 1841 for $16,564.11 where the Watermelon Bayou meets Bayou Boeuf. When the old house at this location was demolished in the 1970's two old wall boards were found that listed: "F. Ricord & Company, Holmesville, La." In the Avoyelles Abstracts, Mr. Ricord is prominently mentioned during the period from the mid 1830's to 1850's having been a Notary Public, Postmaster, Sheriff, Clerk of Court and landowner. In reviewing the above dates, Mr. Ricord was in the Holmesville area from 1837 until at least 1856 when his name was listed as being Clerk of Court in Marksville. In addition to being Postmaster at Holmesville, he also had a store there. He apparently left the area in the 1850's and became Clerk of Court at Marksville in 1856. In Marksville, he had property on the west side of Main Street along Bon Tempt Street. It is believed he had a store front on Main, (where the Avoyelles Journal/Marksvillle News building is today) and other buildings on Monroe Street to the rear. It was in one of those buildings that he apparently unselfishly donated the use of for a hospital during the civil war. *When the “Old Holmesville Home” was torn down the late 1970's at the place where the Watermelon Bayou joins Bayou Boeuf, a few of the boards had addresses on them. Two such addresses, in heavy black ink was: To: "F. Ricord & Co, Holmesville, La., Red River." The sender's address was "Calhoon, c/o Customs House, Levee St., New Orleans." Another such board notes: "F. Ricord & Company, Holmesville, La." [The author’s family lived in this house (Old Holmesville Home - built by Patrick Glaze in 1835) from 1932 to 1950]. I do not have Mr. Ricord's birth record, however I do recall reading somewhere that he was born in France and came to Avoyelles Parish in the early 1830's. Taken together, Fabius Ricord's wholesome, personal service to Avoyelleans is remarkably outstanding during that period in time. For such services Fabius Ricord should be appropriately recognized as Avoyellean of the Year for 1863. Sources: Randy DeCuir and Jerry LaFleur. Listed below are the references to Holmesville that Northup noted in his book. 2. Master Epps was accustomed to attend shooting matches for the purpose of obtaining what fresh beef he required. These sports occurred weekly at the neighboring village of Holmesville. Fat beeves are driven thither and shot at, a stipulated price being demanded for the privilege. The lucky marksman divides the flesh among his fellows, and in this manner the attending planters are supplied. p.174. 3. When it was said that I would die, Master Epps, unwilling to bear the loss, which the death of an animal worth a thousand dollars would bring upon him, concluded to incur the expense of sending to Holmesville for Dr. Wines. (Windes). p.177. 4. During the two years Epps remained on the plantation at Bayou Huff Power, he was in the habit, as often as once a fortnight at least, of coming home intoxicated from Holmesville. The shooting matches almost invariably concluded with a debauch. At such times he was boisterous and half-crazy. p.180. 5. Epps remained on Huff Power two years, when, having accumulated a considerable sum of money, he expended it in the purchase of the plantation on the east bank of Bayou Boeuf, where he still continues to reside. He took possession of it in 1845, after the holidays were passed. He carried thither with him nine slaves, all of whom, except myself, and Susan, who has since died, remain there yet. He made no addition to this force, and for eight years the following were my companions in his quarters, viz: Abram, Wiley, Phebe, Bob, Henry, Edward, and Patsey. All these, except Edward, born since, were purchased out of a drove by Epps during the time he was overseer for Archy B. Williams, whose plantation is situated on the shore of Red River, not far from Alexandria. p. 181. 6. It was determined by the planters, on the receipt of this intelligence, to make up a (group) of slaves to be sent down to Tuckapaw in St. Maiy’s for the purpose of hiring them out in the cane fields. Accordingly, in the month of September, there were one hundred and forty-seven collected at Holmesville, Abram, Bob and myself among the number. Of these about one-half were women. Epps, Alonson Pierce, Henry Toler, and Addison Roberts, were the white men, selected to accompany and take charge of the drove. ...The carriage proceeded in advance, the wagon following; behind this the slaves were arranged, while the two horsemen brought up the rear, and in this order the procession moved out of Holmesville. p. 192. 7. “Old Hog Jaw,” the name by which Epps was called, when the slaves were by themselves, had beaten her more severely and frequently than ever. As surely as he came from Holmesville, elated with liquor-and it was often in those days-he would whip her, merely to gratify the mistress; would punish her to an extent almost beyond endurance, for an offense of which he himself was the sole and irresistible cause. p. 196. 8. My master often received letters, sometimes from a distance of ten miles, requesting him to send me to plat at a ball or festival of the whites. He received his compensation, and usually I also returned with many picayunes jingling in my pockets-the extra contributions of those to whose delight I had administered. In this manner I became more acquainted than I otherwise would, up and down the bayou. The young men and maidens of Holmesville always knew there was to be a jollification somewhere, whenever Platt Epps was seen passing through the town with his fiddle in his hand. p. 216. 9. He (Master Epps) had been absent at Holmesville, in attendance at a shooting-match, and none of us were aware of his return. p. 227. 10. While Epps was in New Orleans, one winter, disposing of his cotton, the mistress sent me to Holmesville, with an order for several articles, and among the rest a quantity of foolscap. p. 230. 11. Returning from Marshall's plantation one afternoon, whither I had been sent on some errand of the mistress, I found him (Uncle Abram) lying on the cabin floor, his clothes saturated with blood. He informed me that he had been stabbed. While spreading cotton on the scaffold, Epps came home intoxicated from Holmesville. p. 253. “I last saw him Christmas, a week ago to-day. 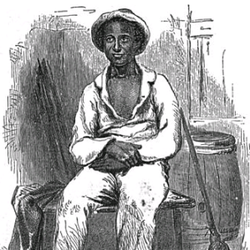 He is the slave of Edwin Epps, a planter on Bayou Boeuf, near Holmesville. He is not known as Solomon Northup; he is called Platt.” p. 298. "In the early 1850's there occurred an event that has placed the name of Dr. Windes in perpetuity. It is the story of one Solomon Northup, a free man of color, who was kidnapped and sold in slavery along the Red River of central Louisiana. After Solomon managed to get a letter out to his family and was discovered by a legal representative and removed from Holmesville, he returned to his former home in New England and wrote a book, entitled, TWELVE YEARS IN SLAVERY. It became a national best seller, in a time when UNCLE TOM'S CABIN was awakening the consciousness of Americans. Northup mentioned Dr. Windes. Indeed, the eventual identifying of Doctor Windes (Solomon had spelled it phonetically) was one of the proofs that investigators needed to verify that Northup's sad sojourn in Louisiana had happened just as he said it had. About 1853, Solomon was working for his most difficult planter, Edwin Epps of Holmesville. Northup became very sick and was thought to be near death. Epps, not wanting to loose his investment, took him to the plantation of Dr. Windes to be treated. "(he) announced to Epps that it was the effect of the climate, and there was a probability of his losing me. He directed me to eat no meat, and to partake of no more food than absolutely necessary to sustain life. Several weeks elapsed, during which time, under the scanty diet to which I was subjected, I …recovered." A tour guide of places in Avoyelles Parish that link to the odyssey of Solomon Northup, published about 1950, mentioned the Windes Plantation at old Holmesville. Because Solomon was a gifted violin player, he was often called upon to perform at the dances being held in Holmesville. Thus Bob (Robert Windes) was acquainted with him as well." Robert Dunville Windes' family grave site at the Ferguson Cemetery in Chicot. D. B. Hudson (the author's great-father) came to Avoyelles Parish from Lowndes County in Mississippi where he was born on March 2, 1842. He was reared and educated in his native State. In 1861 he enlisted in Company A, Thirteenth Mississippi Infantry, and was in Gen. Lee’s army, serving until the surrender. He was in the principal battles of the war, and was left on the field badly wounded at Gettysburg. He finally recovered, and rejoined his command the next spring, remaining with Gen. Lee until the close of the war. He was in Ewell’s corps, and was taken prisoner only three days before Lee’s surrender, but was held until July of 1865. He returned to Mississippi, remained there until 1870, and then came to Avoyelles Parish, La., [Evergreen 1870-1877; Holmesville 1878-1881; Eola 1881-1917] with his family.D.B. Hudson moved to Evergreen from Mississippi in 1870 and was very prominent. [Authors Porter and Barbara Wright wrote in their very fine 1990 book, The Old Evergreen Burying Ground (p. 81): “Act 61 of the 1872 Louisiana Legislature provided for a new corporation styled ‘Evergreen’.” “Take a point in the center of Hill Street, in front of the residence of D. B. Hudson and from this point, to include and comprise one mile square, was to be that set apart for the village…In 1872 he was elected first Treasurer of the Bayou Rouge Church”. D. B. Hudson moved to Holmesville in 1878 and established a very successful mercantile business. He, and others from Holmesville, moved to Eola to be near the newly constructed Morgan's Louisiana and Texas Railroad. He was the last Postmaster at Holmesville and the first Postmaster at Eola when the Post Office was moved there in 1881 from Holmesville. He served eight years in the Louisiana House of Representatives from, 1884 to 1888 and from 1896 to 1900. He died in 1917 at his home in Eola and was buried in Evergreen. He was 75 years old. (Of the fourteen children born to D. B. Hudson and Laura Carr McMakin, only seven lived beyond age 22). In 1890 the Southern Publishing Company published the Biographical and Historical Memories of Northwest Louisiana and noted that the Honorable Daniel B. Hudson was one of the prominent names that made up the strength of the mercantile trade, and that he was not only a gentleman of education and learning, but had high social qualities. Additionally this publication noted that he was a leader in politics in his locality (Avoyelles Parish). “For his recognition as being the last Postmaster at the once prominent village of Holmesville and the first Postmaster at the newly established Post Office in Eola in 1881, along with being elected twice to the Louisiana Legislature from 1884/1888 and from 1896/1900 the Honorable D.B. Hudson should be dutifully recognized as the Avoyellean of the Year for 1896 upon being sworn in a second time as a member of the Louisiana Legislature”. Such representation of the peoples of Avoyelles Parish along with his many other accomplishments, Daniel Bestor Hudson deserves appropriate recognition for the high honor of being the Avoyellean of the Year for 1896. Source: Biographical and Historical Memoirs of Northwest Louisiana, Southern Publishing Company, 1890, p.637. Dr. Christian David Owens was born in Charleston, South Carolina, October 26, 1845, and died in New Orleans, La,. September 15, 1895. He was the son of A. Owens and Eliza M. Hofalt. His fafter was a native of Ireland and his mother of South Carolina. He received his literary education from Georgetown College, Columbia, and was graduated in 1862 from Charleston Medical College. Immediately after graduation he entered the service of the Confederate Army and was assigned to the Army of Northern Virginia as Assistant Surgeon. Soon after the battle of Manassas he was promoted to the rank of surgeon, serving with distinction in Stuart's division until the cessation of hostilities. He then located in St. Louis, Mo., where he enjoyed a large and lucrative practice, which he gave up in 1877 to remove to Avoyelles Parish, La., locating at Holmesville, where he soon established an enviable reputation in his profession, particularly as a surgeon, being considered the most skilled operation in Northwestern Louisiana, and as a consulting surgeon was sought by his confreres throughout that section of the State. He was married in 1878 to Miss Alice B. Winn, daughter of Dr. Wm. A. Winn, a leading physician of the State. Mrs. Owens died in 1879, leaving one child, Samuel Logan Owens. In 1888, Dr. Owens was elected President of the Louisiana State Medical Society filling the position with distinguished ability, and delivering an address so zealously advocating a higher standard in the ranks of the medical profession as long to be remembered. He was at the time of his death a member also of the Avoyelles Parish Medical Society, of which he was and ex-President. Source: p. 69, 70. 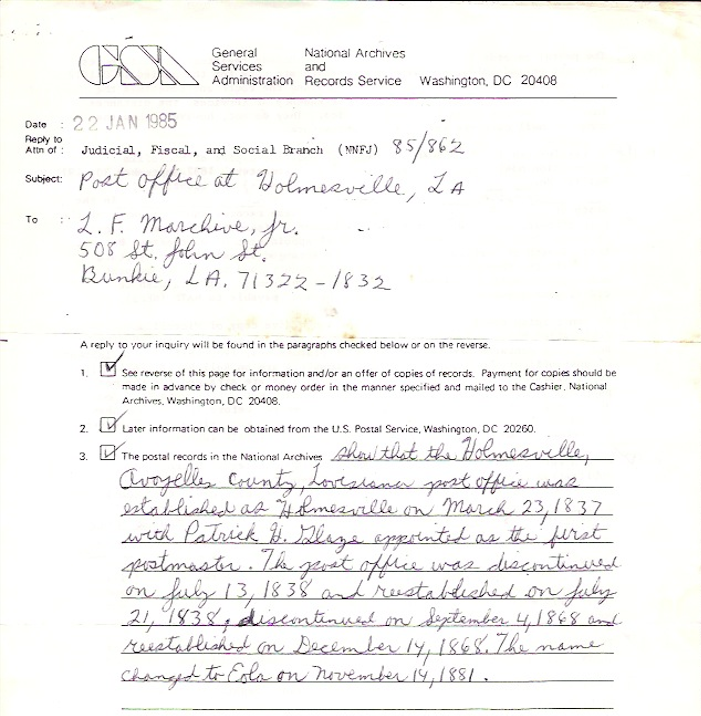 "Transactions Louisiana State Medical Society"
​United States of America, General Services Administration, National Archives and Records Service. Eola was named for the daughter of Judge A. 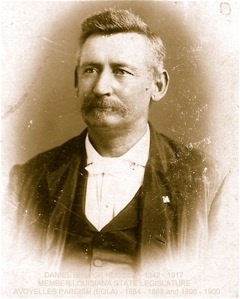 B. Irion, who had moved here from Marksville and was a large landholder. In anticipation of the Southern Pacific Railroad’s branch line from Lafayette to Alexandria, which came through in 1882, the post office at Old Holmesville was discontinued in November 1881. 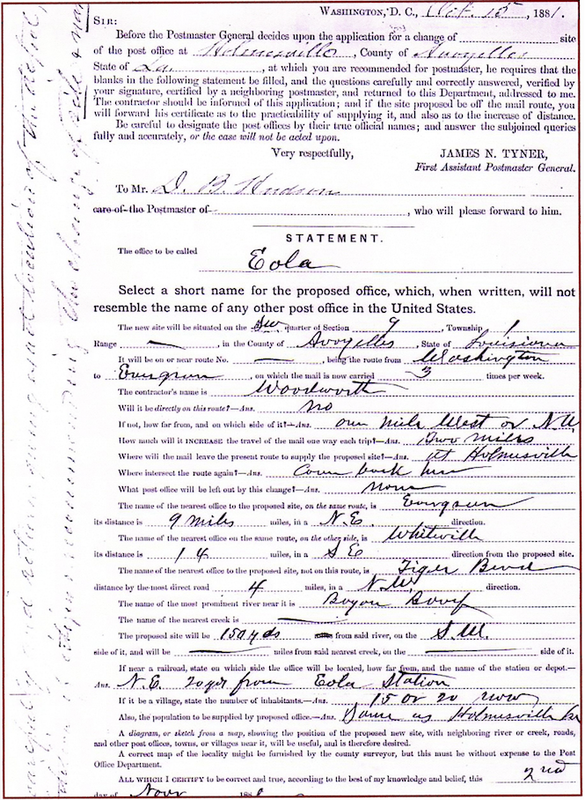 The new post office, named Eola and located about a mile to the northwest on the railhead, was established in November 1881 with Daniel Bestor Hudson (who had also served at Old Holmesville) as postmaster. Eola was strictly an Anglo-American settlement. Ref. Louisiana Place Names, Clare D’Artois Leeper, Louisiana State University Press, Baton Rouge, 2012.